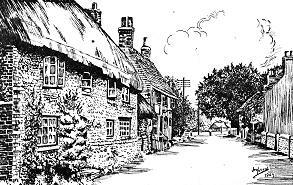 Welcome to the Angmering Village History Centre on this website which contains a considerable number of articles and documentary source information that will interest local and family history researchers and those who wish to find out more about Angmering's past. Some of the articles represent established village history while others are in the early stages of research and therefore provide only initial thoughts. There are currently some 200 pages of articles and other information, and these are being added to constantly, so do return periodically to check what's new. Please feel free to contact us if you require any information on Angmering local or family history (no charge). Click on links to access sub-indexes or use the search engine below for a specific enquiry. Below ground investigations of sites including the roman villa, St Nicholas & Barpham churches, Harrow Hill fort & flint mines. What's New, Angmering books and history related articles, and notices which do not necessarily relate to Angmering but may cover neighbouring villages. This section contains significant documentary resources including some BMDs, Census transcriptions, emigrants, incumbants, marriage licences, land tax records, probate inventories, wills, subsidy rolls, business directories, churchyard inscriptions, and much more. Maps, tithes, and articles on general areas and locations which may cover numerous properties in general terms. Research results on named Angmering families and individuals. These may include family trees and other data. Note: Angmering Village Life cannot accept any responsibility for any error, omission, or inaccuracy in these pages. Always check original documents.